Need a better house for your pet? SuiteDigs are customized pet condos — they are stackable modules that can be put together horizontally or vertically (if they are stacked vertically, staircases connect the modules and your pet can get a little exercise during the day and work on his quads), so that your pet can have different designated rooms for eating, sleeping, and taking care of business. 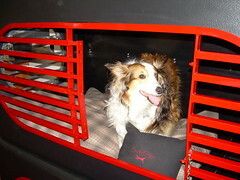 No longer are the days that your pet will sit cramped in a metal cage while waiting for you to get home. Now, he can live in the lap of luxury in his own multi-room house. SuiteDigs also uses “SmartHome” technology which allows owners to interact with their pet over the Internet. You can see what your pet is up to during the day with the webcam and you can even feed him a treat or give him a toy with the Treat Feeder Module. Your pet may love his suite so much that he might actually be excited when you go to work. SuiteDigs will be coming out in the summer. This entry was posted on Thursday, May 17th, 2007 at 3:57 am	and is filed under Cats, Dogs, National Dog, Cat & Pet Info, Products & Services for Cats & Dogs. You can follow any responses to this entry through the RSS 2.0 feed. Both comments and pings are currently closed.